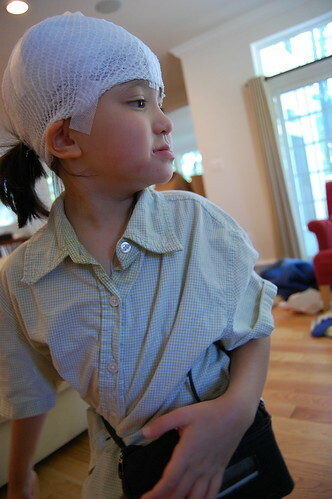 The day we moved into the new house (now well over a week ago), Edda had her 24 hour EEG. We were able to do it most of the procedure at home, we went into the clinic for just an hour or so to get the electrodes attached to her head and then she wore a fanny pack all day and all night. The next morning, we FedExed the whole thing back to the clinic. We took a walk in the afternoon with Edda's head all turbaned up, we made quite a scene - mouthing, wheelchair and head all bandaged. People practically broke out into a sprint from across a lobby to hold open doors for us. They were all thinking: "What the heck happened to her? Edda's hip! But we already knew that. Apparently down here in the blazin Texas heat a tight cap is all the rage. I saw a 20 something kid at Barton Springs last with a wool hat on just like hers. It was white and everything. I had to ask. It was a 102 degrees and we are at the pool and he is wearing a bathing suit. He said he never takes it off and that his grandmother knitted it for him when he was a little kid. His girlfriend smiled and said he looked cute. All I kept thinking was what if he goes off the diving board and how does he wash his hair?